The carotid arteries are the main arteries in the neck that supply the brain. Narrowing of these arteries due to build up of fatty deposits, cholesterol or plaque can cause a stroke either due to showering of cholesterol or clot up to the brain or in severe cases due to complete obstruction of the artery. Many patients will suffer mini-strokes or transient ischaemic attacks (TIAs) with full recovery within 24 hours. These TIAs are however a warning that the individual is at risk of a major stroke. Initial imaging investigation of carotid artery disease is usually by a doppler ultrasound examination which may be supplemented if necessary by MRI scanning, CT scanning or angiography. In less severe cases of carotid artery disease modification of risk factors may be all that is necessary, e.g. stopping smoking and reducing high blood pressure and cholesterol by dietary modification and medication. In more severe cases of narrowing surgery or stent insertion may be considered. Surgery in the form of carotid endarterectomy is performed by vascular surgeons and carotid artery stenting is usually performed by interventional radiologists. 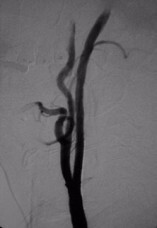 Patients are usually under the care of both a vascular surgeon and the radiologist and there is very much a team approach to treatment. There are ongoing studies comparing the risks and benefits of open surgery and stenting and there are relative advantages of both. The aim in either case however is to reduce the risk of life-threatening stroke. Dr. Crowe and his team offer carotid artery stenting privately at the Priory Hospital and on the NHS at Birmingham Heartlands Hospital. For further information or to make an appointment please use the contact form or speak to Dr. Crowe’s secretary on 0121 – 448 1502.